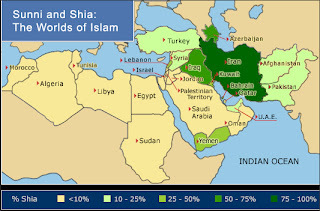 While many look at the Middle East as a series of individual countries, underneath the fabric of a traditional geo-political analysis lies a religious split within Islam dating back 1,400 years to events immediately after the death of the Prophet Muhammad. For example, while the revolt in Syria against the regime of President Bashar al-Assad is usually depicted as morality tale of an opporessed people fighting against a hated ruler - and certainly no one would deny that al-Assad's regime is odious - the reality is that the events in Syria also reflect deeper underlying currents of sect and ethnicity. To have more than a cursory understanding of the region, it is critical to possess at least a basic knowledge of the Sunni-Shia split within Islam. The Sunni-Shia rivalry goes back 1,400 years, and in a nutshell involves the different sects beliefs about who was the legitimate successor to the Prophet Muhammad after his death in 632 AD in what is now Saudi Arabia. In a nutshell, one group of the Prophet's followers believed the next ruler - the Caliph - should be chosen by the community of Muslims as best able to represent the new faith. The Shia, by contrast, believed that the leader of Islam should stay within the Prophet's family, and they favored the Prophet's cousin and son-in-law Ali as the next Caliph. This is a most useful blog. If Iran gets its nuke than the all Sunni states will start to reach that goal too and the 3rd world to follow them. It's time to destroy Iran and rebuilt her as a pro-Western state and society! As a shiia I can say the information are wrong given by this blog. They don't say the next leader after prophet's death should be within his family, but they say that during the ceremony if ghadeer(after prophet's last hajj) he announced that imam Ali is the leader of Muslims and even the Sunni caliphs shakes hands with him, but they denied it afterwards. Also i feel sorry for you that you think only certain countries should have atomic technologies. This is a right for everyone to have the power if it's used peace fully and within law. This is western world which is using this technology to thread other countries. OPEN YOUR EYES TO REALITY AND DON'T BE SELFISH.